The festivities start at 1pm and the club will provide the comestibles and soft libations (that's food and soft drinks). Alcohol will be BYOB. We want to take this opportunity to thank our beloved member Hank, for hosting the event once again and we extend our appreciation for his gracious hospitality. If you never had some of Hank's world famous BBQ, then this is your opportunity! For our outing this year, of course, as always, pipe smoking is allowed, encouraged, and de rigueur! As I mentioned, I am trying to line up a special Mystery Guest and I hope that he can make it and join us for what is always a festive occasion for the club! I won't tell who he is so you'll just have to make it a point to come out and join us to find out!!! Either way, you won't be disappointed that you came. At this years Chicago Show, there was the usual huge selection of new and estate pipes, as well as some wonderful new blends which were debuted at the show. The blending genius of none other than our good friend, Russ Ouellette, received alot of attention as Russ has produced 4 new blends designed specifically to be smoked in a corn cob! That's right; these blends were produced for optimum performance in a corn cob pipe. 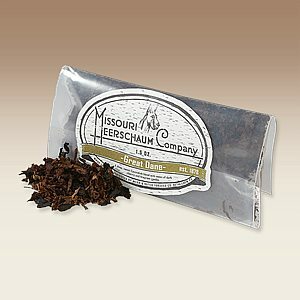 The blends are marquee'd under the Missouri Meerschaum name, naturally! Also, commemorative cobs were produced for the occasion – does anyone see a connection to a NY Pipe Club Summer BBQ theme!?! YES, I DO!!! So, for this years event, we have selected the new Mark Twain model from Missouri Meerschaum, which debuted at this years Chicago Show! Fortunately, I was able to secure 30 cobs, 15 bent and 15 straight! Special thanks go out to our friends at pipesandcigars.com, Eric, Trish and of course Russ in helping to provide the cobs and the tobacco, I cannot thank you all enough! The all new Mark Twain corncob has a smooth Dublin shaped bowl with a large capacity. This pipe was made for long, contemplative smokes after a busy day. 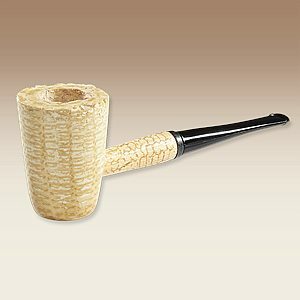 Sit back, pack a bowl and relax with the brand new addition to the Missouri Meerschaum collection of cobs. The Mark Twain is the perfect large, light weight corncob that you have been waiting for. Comes in bent and straight stemmed models. And to compliment the new Mark Twain Corn Cob pipe, this years tobacco offering will be the 4 new Missouri Meerschaum Corn Cob Blends, blended by master tobacco blender, and friend of the club, Russ Oullette. These blends debuted at the 2014 Chicago Pipe Show and were a huge success. These four blends will be waiting for you after you receive your official club cob. 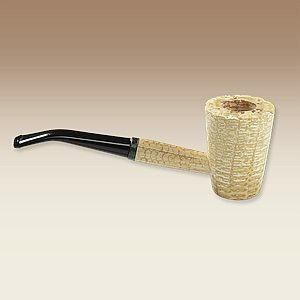 The Missouri Meerschaum Great Dane pipes are their take on Danish designs, so when we wanted to make a tobacco with the same name, we thought that a Danish-inspired aromatic would be the best choice. This blend consists of a good portion of gently-steamed black Cavendish, select Virginias and some white Burley, which have been topped with a smooth and rich combination of a deep, dark cherry, without the sharpness of the typical "maraschino" flavor, and warm notes of vanilla and caramel, for an easy-smoking blend with a lightly-sweet flavor and an amazing aroma. 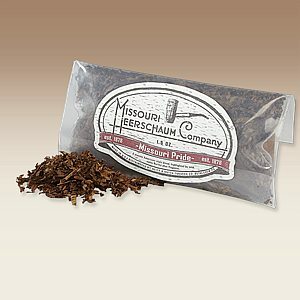 Missouri Pride is the kind of blend that most pipe enthusiasts would associate with the Missouri Meerschaum corn cob experience. This is a blend of superb quality Burleys with some Virginias added, and minimal top flavoring. The blend is made up of broken flake, with some ribbon-cut Burley, for a nice, even burn, and the flake processing adds a deeper flavor to the tobacco. For a smooth blend with real tobacco flavor you can enjoy all day long, try a pouch of Missouri Pride. 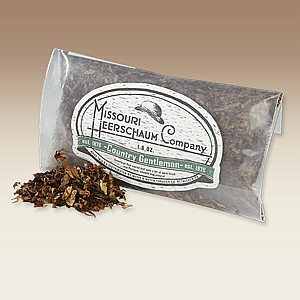 Country Gentleman represents a unique departure among pouch tobaccos. This blend features a mixture of premium bright and red Virginias, which is enriched with Perique, and a small amount of dark-fired Kentucky for body. This is a tobacco that would be at home in a tin with a higher price tag, but to befit bearing the Missouri Meerschaum name, it comes to you at an everyday bargain price. Enjoy the naturally sweet, and tangy character of Country Gentleman. 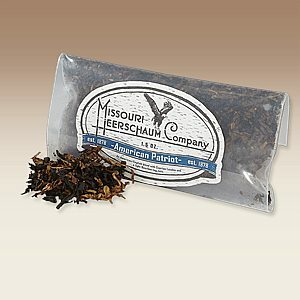 American Patriot is a highly unusual type of blend to find in a pouch. This is a Latakia-based blend, enhanced by quality Virginia leaf, and the exotic influence of Turkish Smyrna, with just a touch of Burley for excellent burning characteristics. A light top note of Kentucky Bourbon makes for a nice addition to the aroma, but is undetectable in the flavor. For a superb value in an English-style blend, light up a bowl of American Patriot. Free food, free 'baccy, a free cob - who wouldn't want to attend? Whether you can or you can't make it, please RSVP "Yes" or "No" to this email or call Lou at 347-886-9784 so that we'll have an idea of who is coming. We need to know how much food and drink to buy so please let us know even if you aren't planning to attend the gathering. Wives and children are also welcome. For those without cars, take the bus out of Port Authority in NYC to the East Brunswick Tower Center stop or take the North East Corridor Line train from Penn Station to New Brunswick, use the express if possible. In both cases, we will work on arranging to have you picked up from those stations to Hank's place which is a short drive away. If we know who is coming we'll also try to coordinate car-pooling from New York City. Call Lou at 347-886-9784 and I'll try my best to work it out. "The bus service to the East Brunswick Tower Center is Suburban Transit (Coach USA) and their gates are on the fourth floor (Gates 417 to 420) at Port Authority, NYC. Check at their ticket booth before you go up to the platform (the ticket booth is on the first floor) to buy your ticket. I believe it is about $9.00 each way. Buses depart every half hour on the hour. I would recommend the bus service rather than train. It takes the same amount of time and is closer to Hank's house." IMPORTANT: For those driving, we need you to bring a folding chair or two. Hank has a limited number of seats so additional seating would be much appreciated. BTW, this event is free and is made possible by your voluntary dues payment of $25 per year. If you haven't paid your 2014 dues, now would be a great time to do so via the website, mailing a check or by seeing Lou. If you aren't sure whether you are a 2014 member, just ask! FYI... if you are a sharp detective (Mike B. you don't count - unfair advantage!) you may have detected a bit of a clue about the Mystery Guest but I will say no more! This looks to be yet another great pipe event of the social season, so don't miss it. Mark your calendars, warn your spouses, and start choosing your best picnic pipes. See you there!